Heat the oil in a large saucepan over medium-high heat. Add leeks and sauté for 5 minutes, or until softened. Add the squash and chestnuts and cook 3 more minutes or until nicely coated. Add garlic and cook for another minute. Add the stock, syrup, salt and pepper, and mix together. Bring to a boil and then reduce the heat to medium low and, cover and simmer over medium heat for 20-25 minutes, or until the chestnuts are tender. Add the lemon juice. 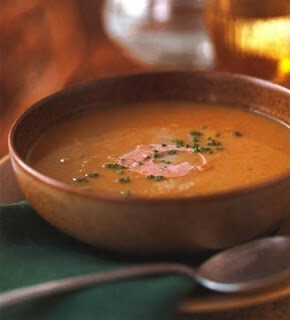 Meanwhile make the chipotle cream: combine the chipotle puree with creme fraiche in a small bowl and mix to combine. Season with salt and taste for seasoning. Reserve. Puree the soup in the pan with a hand blender or in a blender or food processor fitted with the metal blade. Return the soup to the pot if necessary. Taste for seasoning. 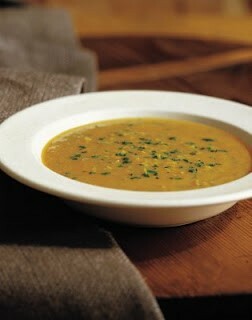 To serve, ladle the soup into heated bowls, swirl in a tablespoon of chipotle cream and garnish with chopped chives. May be prepared up to 3 days in advance, covered and refrigerated. Reheat gently. This soup also freezes well. Adjust the seasonings when you reheat the frozen soup. Place the beets in a large saucepan and cover with an inch of water. Place over medium heat and simmer for 45 minutes to 1 hour, or until fork tender. Remove the beets from the pan, reserving 2 cups of the beet juice and place them in a colander. Run under cold running water and peel. Cut the beets into ¾ inch pieces and reserve. In a large soup pot heat 2 tablespoons of the oil on medium-high heat. Brown the meat in batches, making sure not to crowd the meat, for about 5-7 minutes for each batch. Reserve the beef. Add the remaining oil and saute the leeks and carrots for about 5-7 minutes or until nicely softened and lightly browned. Add the 2 cups of the beet juice, reserved beef, tomatoes, cabbage, water, tomato paste and dill weed to the vegetables making sure to scrape up all the browned bits from the bottom of the pan. Bring to a simmer, partially covered, over medium heat and cook for 1½ hours or until the meat is tender when pierced with a fork. Add the reserved beets, vinegar, brown sugar, salt, and pepper and simmer 5 more minutes. Taste for seasoning. You may need to adjust the sweet and sour flavoring to your taste. 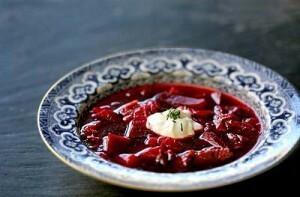 To serve: Ladle borscht into deep soup bowls and garnish with sour cream and a sprig of dill weed. To avoid red hands and stained cutting boards, use kitchen gloves and place a piece of plastic wrap or foil on the cutting board. If you find beet stains on your cutting board, use a little bleach cleanser and the stains will come out. Serve it with big chunks of warm country bread and soft butter. You can also steam little potatoes and add them to the soup at the last minute.